A teacher and artist committed to community arts engagement through innovative and impactful programs, utilizing a breadth and depth of studio art experience along with a dedication to equity and inclusion in the classroom. Gubernatorial appointment, advising on the dispersal of grant monies to arts organizations statewide. Liaison to New Leaders sub-council, member of Art Education Committee. Participant in yearly grant review panels. Collaborated in development of new grant program for equipment and supplies for K-12 teachers. Site visits to grant awardees, along with outreach to future grant applicants. Participant in monthly National Association of State Arts Agencies professional development programs. Political advocate on behalf of MCACA at both the state and federal level. Developing new programs for museum’s K-12 in-gallery experiences, along with the production of framing curricula for classroom teachers’ use in preparation for and reflection on the museum visit. Giving common-core and information based tours of the museum’s encyclopedic collection, along with learner-centered and inquiry-based Visual Thinking Strategies experiences in the galleries. Peer coaching for best practices. Conceiving and implementing new evaluation and assessment systems for museum educators. Communicating with teachers in planning field trips, preparing students and chaperones for the museum experience. On-site organization of arrivals, tours, docents, lunch schedules, and departures. Expediant cross-departmental problem-solving. Working within the Group Reservations Department to schedule and book student and senior groups. Assisting in attendance tracking for Tri-County Art Authorities to ensure fulfillment of millage-related commitments. Facilitating monthly outreach activities, including community drop-ins, Empty Bowls fundraisers, and special-group clay classes. Teaching wheel-throwing classes to members and drop-in participants. Cultivating community partnerships with neighborhood organizations involved in recreation, social enterprise, workforce development, and the arts. Coordinating communication among co-op members, with a focus on the technical workings of the studio including organizing studio work-nights, maintaining studio workspace and daily functions. – Conceiving, proposing, and teaching a variety of classes and workshops for both adults and youth onsite in the Pewabic Pottery Education Studio. Focusing on building wheel-throwing skills, classes have focused on throwing large forms through a variety of techniques; ‘accessories,’ thoughtful handles, spouts, lids and additions; and altering forms on the wheel. – Coordinated and implemented a curriculum of after-school clay classes – incorporating pottery, sculpture, art history, science, music and social studies into hands-on art-making experiences. Worked at multiple sites in the Detroit Public Schools, focusing on 3rd through 8th grade. – Developed and taught a common-core derived Pre-K curriculum. Lessons include shapes, colors, alphabet, homes, families, emotions and nutrition. Observable outcomes include language development, fine motor skill acquisition, visual and auditory processing, cognitive and emotional development. Partnered with third-grade classrooms to teach lessons inspired by Tyree Guyton’s installation. Led educational activities and class tours at the Heidelberg Project site, followed by art-making in the classroom using recycled materials. Lesson plans featured units on community engagement, music, watercolor portraiture, homelessness, storytelling, and civics. Developed curricula and taught a set of clay classes for youth and adults in both Spanish and English. With an emphasis on inter-generational and inter-cultural arts experiences, classes tied into other activities at this arts-focused Latino community center, including break-dancing, carpentry, and music. Developed and implemented curriculum for 3rd, 4th, and 5th grade Gifted Visual Art program; units included scenic design, book binding, ceramics, fibers, printmaking, and macramé, all utilizing recycled or innovative materials. Collaborated with classroom teachers to build curriculum-integrated lesson plans. Engaged students in conversations and critiques discussing a broad range of aesthetic concepts. Designed, coordinated, and facilitated the creation and installation of a community tile mural installation. community art projects, including liturgical worship space decorations, a nine-panel stained-glass door installation, and a community-wide art collection for gallery exhibition. The RIDA Institute: education theory lectures with Grace Lee Boggs of the Boggs Center, Nate Walker of the American Federation of Teachers, and Patrick Camangian, Ph.D. of the University of San Francisco’s Department of Education. Emphasis on Paolo Freire’s critical pedagogy and classroom practices which nurture participatory learning. Network Gatherings: workshops on arts-infused lesson plans and medialiterate classrooms, student focus-groups and collective visioning on strengthening school communities. Intensive exploration of teaching strategies developed by the Visual Understanding in Education Initiative. Training in the facilitation of Thinking Through Art encounters in both museum and classroom settings. This learner-centered and inquiry-based approach to aesthetics inspires critical thinking, develops public speaking and social skills, and deepens interpretive thinking cross-disciplinarily. A work/learning partnership, working side-by-side with the master potter 40-50 hours per week. Produced own work, utilizing studio methods, materials, and kiln firings; maintained studio. A student of Charlie Tefft, workshops with Michael Hunt, Hajimu Kato, and Kevin Crowe. 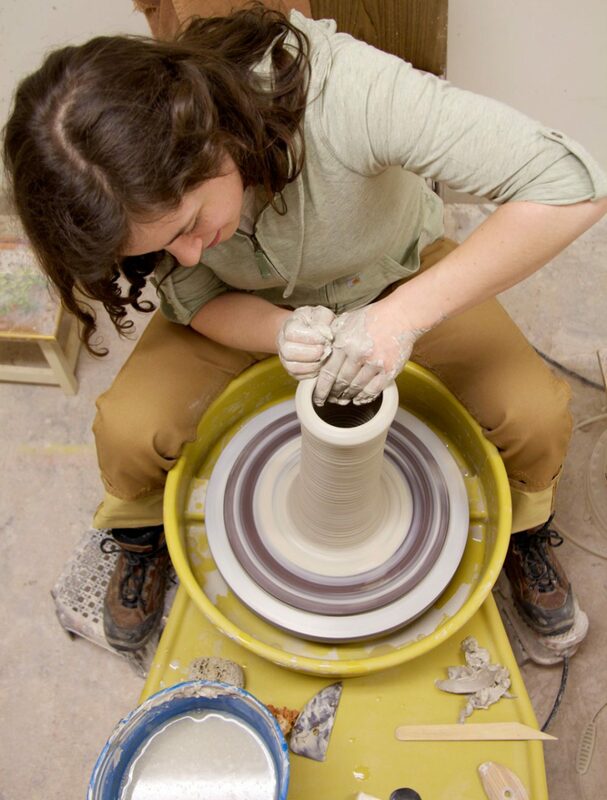 Assisted with hands-on beginner wheel-throwing instruction, facilitation of critiques, and grading of student work. Coordinated and implemented kiln loading and firing schedules, implemented studio maintenance workdays among students. Coordinated within the Art Department to install the Annual Juried Student Show. Art history immersion program with a focus on Medieval and Renaissance Italian art. Studied functional pottery with local materials while researching the history of Tuscan and Umbrian pottery.